Detail, ReNew and Protect your '91-'01 Ford Explorer or Mercury Mountaineer's Flat Black door pillars with our Door Pillar Enhancement Decal kit. 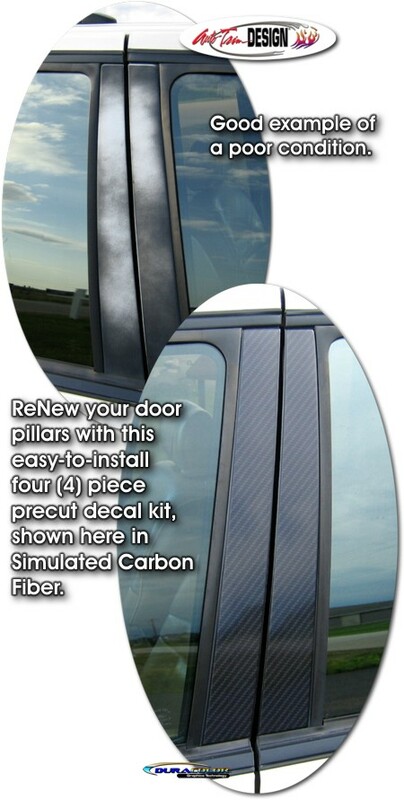 Manufactured with our DuraCOLOR Graphics Technology, this great-looking decal set - available here in Simulated Carbon Fiber - will enhance the overall look of your ride, at the same time keeping the door pillars looking great! As a further step, decals are covered with a 2.5 mil clear laminate which provides protection from miles of abuse. Packaged as a set of four (4) pieces, decals are vehicle specific and fit any '91-'01 Ford Explorer, Ford Explorer Sport or Mercury Mountaineer and will not fit any other vehicle.